Yesterday I got a request from a reader to make a post on Krishna Janmashtami celebration / Gokulashtami celebration at home. 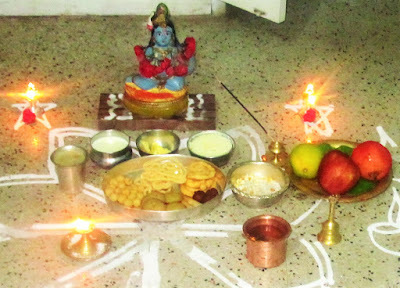 So I have discussed how to celebrate Krishna Jayanthi/Gokulashtami/Krishna Janmashtami at home by Indians especially South Indians in a very simple way. I have also shared a video on how to draw Krishna feet using rice flour paste. Pooja procedures I have given here is based on my family's tradition. It may vary from place to place. So take this as a reference and get the guidance from your family elders. As you all know, Krishna Jayanthi is celebrated as the birthday of Lord Krishna.It’s a most important and sacred day for Hindus. People pray to Lord Krishna on this day and seek his blessings for a happy and good life.Krishna Janmashtami is observed on Ashtami – the eighth day of Krishna Paksha month/Shravana month i.e between mid August & early September. This year it falls on September 2nd, 2018 - Sunday evening. It is celebrated all over India. In Tamil nadu, Kerala, Karnataka and North Indian temples, Gokulashtami is celebrated in a grand manner. Festivities begin before dawn and extend all day until midnight, the exact moment of the anniversary of Krishna’s appearance. Many people observe fasting on this day. But we don't have that practice. At home, we do the pooja only in the evening i.e after 6 pm. On those days, my MIL used to do the pooja around 11 pm at night.So its better to do the pooja anytime after 6 pm till midnight. Midnight is the exact time that Krishna appeared on this planet, so it is the most auspicious and spiritually inspiring time to perform pooja. 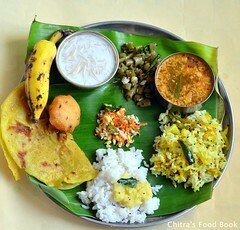 Temples prepare at least one hundred and eight different food dishes on Janmashtami. 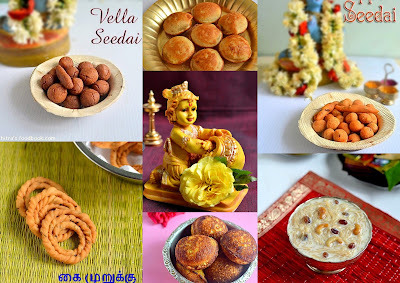 At home, Tamil people do the pooja by offering flowers, neivedyam recipes like seedai , murukku, laddu, appam, payasam/Kheer etc and performing Mangala aarti to Lord Krishna Idol or photo. If you are not able to prepare all these dishes,don’t worry - Krishna says in the Bhagavad-gita, “If you offer me with love a leaf, flower, fruit or water, I will accept it.” So offer whatever you can - it’s just your love and devotion that matters. 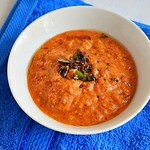 Please click here for the full collection of Krishna Janmashtami recipes of my blog ! 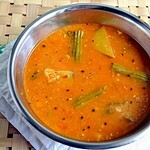 I have also shared a No cook Aval panchamirtham recipe with fruits to make a simple neivedyam. Visit my in-laws blog for kolam ideas. 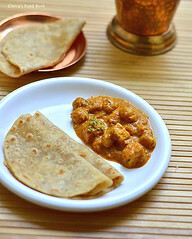 Please click here for the full collection of Krishna Janmashtami recipes of my blog. Rice flour and colors for drawing Rangoli and Krishna feet. 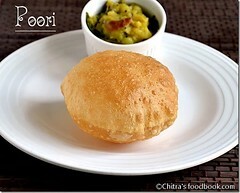 A small cup of milk, curd, butter, Poha/Aval mixed with jaggery or sugar. 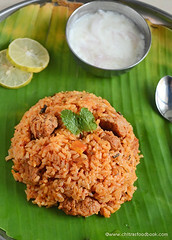 These offerings are must and should even if you don’t prepare sweets and snacks. Do the shopping two days before the festival and finish making the deep fried neivedyam recipes like vella seedai , Uppu seedai , Kai murukku etc on the previous day of festival. 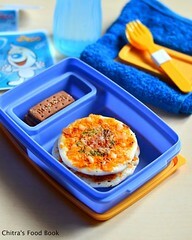 Store them in an air tight box after everything cools down completely else they may turn soggy. 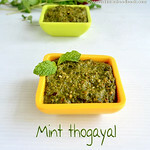 DO NOT TASTE IT UNTIL YOU FINISH POOJA. Wash the lamps and other pooja vessels on the previous day night and keep the turmeric, kumkum dots.Put the threads and oil the lamp. Suppose if you don’t have enough time, you can do this job the next day morning or afternoon as we are going to do the pooja only in the evening after 6 pm. So its your choice. In many houses in South India, people draw footsteps of Lord Krishna from the entrance of the house to the Puja room. These footsteps are drawn with rice flour paste and drawing these footsteps is a sign of welcoming Lord Krishna to home. 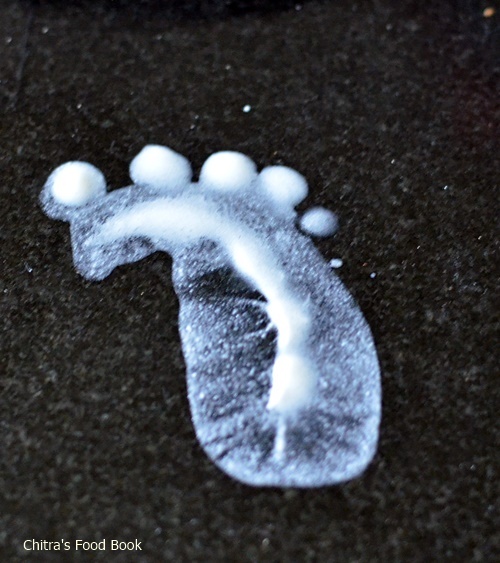 Women draw patterns of tiny footsteps like those of infant Krishna. I have given a video below on how to draw krishna feet using rice flour. Please watch it to draw easily. Take a broad plate such that your hands should fit in. Dilute the rice flour adding enough water and make the paste. Do not make it too thick or too thin. 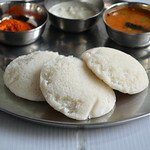 Its consistency should be like dosa batter. Now fold your hands as if you are punching someone😉. Dip your side of the hand in the rice paste. It will be coated with the paste. Now make the impression on the floor. Keep 5 dots for fingers. Draw the right leg first. Repeat the same procedure using your left hand for drawing left leg. Do this alternatively. Draw both the legs together near the entrance and pooja room. Refer the stepwise pictures for clear understanding. For drawing legs of baby Krishna, fold your hands tightly and make the impressions as shown in pics. If you want to draw slightly bigger legs, watch this video. Alternatively, u can ask your kids to make impressions on the floor. They would enjoy doing this and help you out . After you finish the decoration and neivedyam preparations i.e after 6 pm, place the decorated Krishna on a plank/Peeta. Offer all the neivedyam recipes, fruits, curd, milk, butter in front of the God. Light the lamp and do the pooja, perform Mangala harathi. You can sing Krishna songs or read Bhagavad Gita/Sri Krishna Ashtakam OR simply chant “Om Namo Bhagavate Vasudevaya “means “Om, I bow to Lord Vasudeva or Lord Krishna’'in front of the GOD. To perform a simple pooja without any special neivedyam recipes, just garland the Krishna idol, garland it. 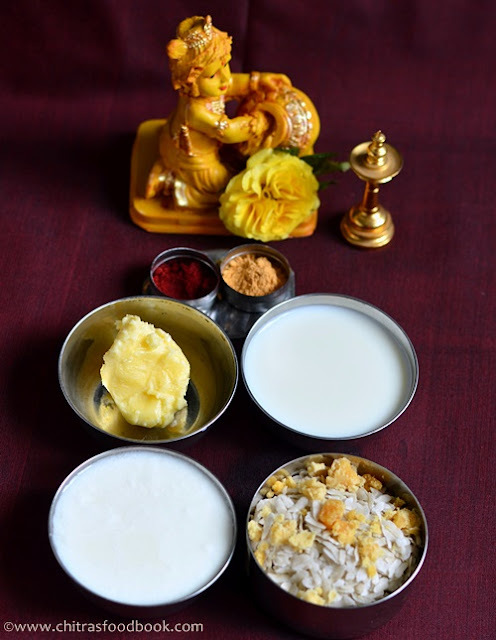 Light the lamp, Place a small cup of milk, curd, butter, Poha/Aval/rice flakes mixed with jaggery or sugar. Do the pooja and mangala harathi. Please check the picture below for reference. The next morning, do the pooja with a simple neivedyam like dry grapes or candy(kalkandu). Remove the idol at a good time of the day ( Avoid Rahu kalam and Yama kandam ). DISCLAIMER : The details I have shared here is purely our family’s method of celebration.It may vary from place to place based on your traditions. So please take this as a reference, consult the elders of your family for more guidance. Mathura is the birthplace of Lord Krishna and this is the only city where swings decorated with fresh flowers and bells are hung in courtyards of temple and houses to celebrate the birth of Lord Krishna. 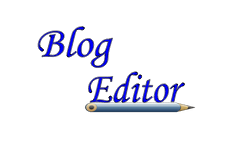 This blog is more informative. Lord Krishna was born to eradicate Adharma. 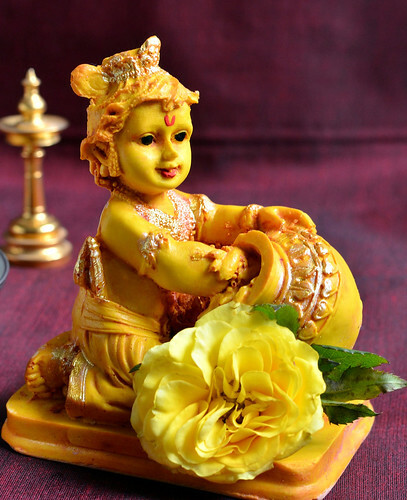 On this auspicious day we celebrate Krishna Jayanthi 2016 Special . Worship Lord Krishna on krishna jayanthi. This is really interesting, particularly the way you described the sequence of the Gokulashtami day,took me to my boyhood days. Now though the spirit is live, there are practical inabilities as well as the ignorant attitude of the wards lessen the process but I do it with devotion with my wife who is a Christian by birth but always extends her best cooperation in each of the festivals. Though not for my bakthi but for her devotion the Lord will certainly bless my family.